It emits number of negative ions into surrounding atmosphere when it is heated by an external source of electric or candles. It eliminates the positive ions which are present in our environment, produced by computers, refrigerators, televisions and more. Natural salt crystal is found in ancient evaporated sea beds underneath great mountain masses, such as the Himalayas, where it has been compressed over time to form solid salt rock, with all the minerals structurally intact. 1.If there is water in the lamp, please dry it to avoid getting wet. 2. Please make sure that the switch on the lamp is turned off. Then plug it into the wall plug and turn it on. 3. Each lamp is in the unique shape; it may have a little different from the product image. Its dimensions and weight vary. Unique Design - Hand selected from the Himalayan Mountains, each lamp is made from highest quality-AA level salt crystals with the best clarity, and crafted to allow the insertion of a UL approved plug. Wide Application - It serves as a stylish decoration lamp in bedroom, living room, kitchen, coffee shop, book store, bar, and so on. Safety Guarantee - With UL certificated Plug, which can be adjusted for 360 degree. No cords or extra space needed. Adjusts 360 degrees around for horizontal sockets. Warranty - The salt lamp enjoys 45 days money-back and 12-month, worry-free Guarantee! If you have any questions about this product by TomCare, contact us by completing and submitting the form below. If you are looking for a specif part number, please include it with your message. 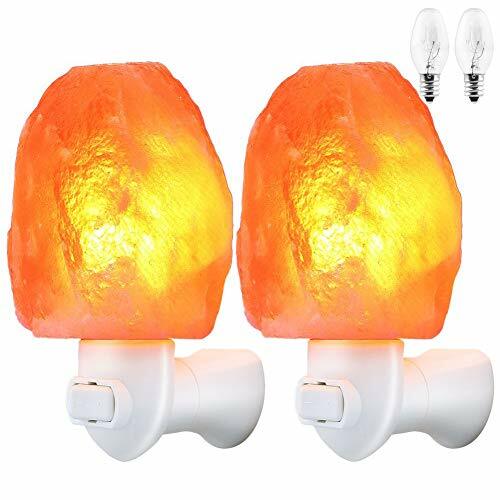 Crystal Allies Gallery CA SLS-S-2pc Crystal Allies: Set of 2 Natural 5-8 lbs Himalayan Salt Lamp with Dimmable Switch and 6' UL-Listed Cord, 4" x 4" x 6"